When you’re faced with the daunting task of setting up a computer network - whether it’s an easy in-home network for personal use, or a more extensive network for your business - it’s important to make sure that you’re using the highest quality computer cable possible. 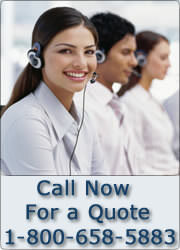 At Gruber Communication Products, we offer a wide variety of cables, one of the most common of which is Cat5e cable. Available in a variety of colors and different sizes, these CAT5e patch cables include protective boots and are the most common networking solution for home or office users. 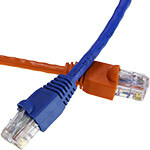 Designed for today's high density patch panels, these CAT5e patch cables are also built for modems, hubs, and routers. Choose between 1-200 feet in length, with our CAT5e patch cables that are specifically designed for vertical shaft applications. These CAT5e patch cables come in a solid conductor format, which is the most useful for structured wiring within a building. Made for most plenum applications, these CAT5e cables work well with network computers in either commercial offices or homes. 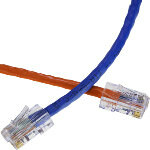 These Cat5e cables are used for sending data signals across a computer network. 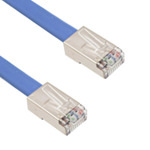 A Cat5 cable is essentially the most basic network connection available and is able to support 10 to 100 Mpbs Ethernet and has a capability of up to 350 MHz. The Cat5e copper cable has been proven to be easy to install, strong, have great electrical connectivity, and easily resist corrosion. In addition, we also offer shielded Cat5e, which is good for networks that need more privacy; solid Cat5e, which are usually less expensive than their stranded counterparts; and non-booted Cat5e, which take up less room and is easier to plug and unplug in a crowded network.